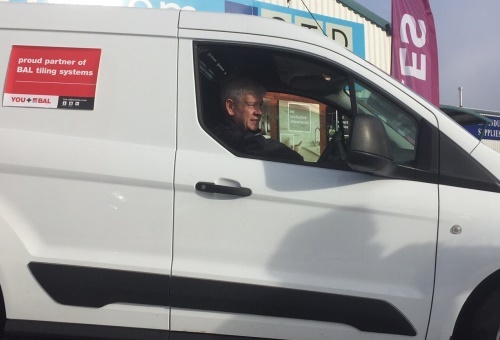 Dundee-based tiler Gordon Mitchell has taken delivery of his new van after winning Ceramic Tile Distributors (CTD) and BAL’s Win a Van Competition. 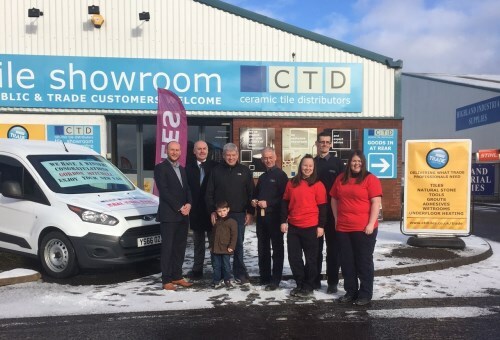 The 60-year-old is a regular customer at CTD’s Dundee branch and started tiling 40 years ago after completing a four-year tiling apprenticeship. Gordon and his team of fixers work throughout Tayside and Fife primarily with housebuilders on new build developments and is a regular user of BAL tile adhesives and grouts. He said: “I’m a big fan of BAL and have been using them for a long as I can remember. I use BAL Rapidset Flexible and BAL Superflex grouts – and I’ve never experienced a problem, it’s always good gear. “When Kenny McCracken the Branch Manager at CTD Dundee told me I won, it came as a complete surprise as I never expected to win just through buying BAL. The Ford Transit Connect was presented to Gordon by Allan Mann, CTD Scotland Operations Manager and Craig Sinnamon, BAL Area Sales Manager for Scotland. To be in with a chance of winning the van, fixers had to spend £150 on BAL products at CTD in three consecutive months. CTD Trade Loyalty Card Holders got double entry into the competition, while members of BAL’s YOU+BAL Partnership Programme were given three entries. Each qualifying branch that had customers who spent £150 in 3 consecutive months also had 1 winner who won their weight in adhesive. To sign-up to YOU+BAL Partnership Programme CLICK HERE.